I first saw Abigail Arias story shared on social media by Freeport Police Department. The story was about a 6 year old girl with terminal cancer who they had sworn in and made an honorary police officer. Abigail wanted to become a police officer so she could fight the bad guys inside of her, the cancer. The story truly touched my heart, as cancer was all too familiar with my family, as I lost my dad to cancer when I was 16 years old. I just had to meet Abigail, and I wanted her to meet my K9 Quelle, who I knew would just fall in love with Abigail. 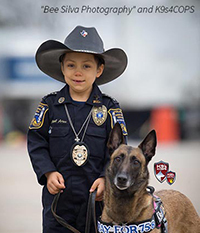 During this time, K9s4COPS, a non-profit based in Houston, Texas, that raises money to purchase fully trained police dogs for departments around the United States, was having their Hard Dog Fast Dog Competition soon. K9s4COPS gifted me both K9 Quelle and my police dog, K9 LeMans. I wanted Abigail to compete with me. I reached out to my boss, Constable Alan Rosen, with Harris County Constable Precinct One, and requested permission to travel to Abigail’s school and speak with her and her entire kindergarten class, accompanied by K9 Quelle. He granted me permission to do so. I then reached out to Freeport Police Department and set up the surprise visit with Abigail. One week before Hard Dog Fast Dog event, I met Abigail at her school. I immediately fell in love with her. She is a vibrant, full of life, witty, and beautiful little six year old girl, whose smile lights up the entire room. She met K9 Quelle, and it was a perfect match. K9 Quelle accepted that little girl with a wagging tail and wet, slobbery kisses. Abigail couldn’t stop smiling, and neither could I. Abigail would hide the tennis ball and have K9 Quelle find it, thinking that was the most fun thing. We then did a demonstration with Abigail’s class. Abigail showed off some tricks she had quickly learned with K9 Quelle. They stole the show, and my heart. I told Abigail that K9 Quelle was now officially her police dog and could use her any time she wanted. K9 Quelle would help her fight the bad guys inside her. Abigail was so proud to hold K9 Quelle’s leash, and beamed with pride at her new dog. 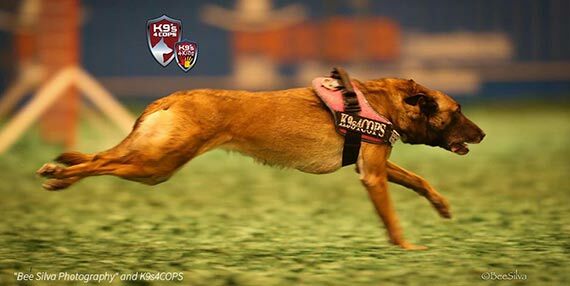 Fast forward a week to the K9s4COPS Hard Dog Fast Dog Event located at the Houston Rodeo and Livestock Show. The day of the event, Abigail met me at the event a few hours early. We did photos and then went and had fun before the event started. We got a corn dog, her boots shined, and told lots of silly jokes. It was then time for the competition to start. We let Abigail and K9 Quelle do two practice runs before the actual competition. Hard Dog Fast Dog is an event which showcases our police dog’s ability to show how fast they can get to a bad guy (decoy), and how hard they take them down. Much to Abigail’s surprise, I told her that K9 Quelle was a two time champion for this event. She was so excited to hear that and once again beamed with pride. The stands were packed with people who came to view the event. Police Officers and K9 Handlers from all across the state of Texas were here. 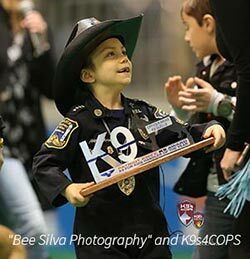 But they had no idea that the littlest officer there was going to be there biggest competition! Abigail was also an honorary judge for the competition, so she was going to compete last, with 14 dog teams before her. When it came time for her to run, she could hardly contain her excitement, and neither could I. When the announcer spoke to the crowd, getting them excited, Abigail turned her game face on. K9 Quelle seemed to sense the severity of the event, as she also became very serious and was focused. Abigail took the leash from me and we walked inside the arena. The bad guy was 30 yards down the arena, dressed in a bite suit with a shirt over it that said “TAKE A BITE OUT OF CANCER”. I told Abigail that I think she is going to win this event. She yelled “Bad guy stop, or I’m going to send my dog”,and she then released K9 Quelle. I watched as K9 Quelle sprinted down the arena floor as fast as she could, and then it happened. She launched, seeming to fly in the air towards the bad guy. And she took him down, hard. He fell and she continued to “take a bite out of cancer. Abigail and myself ran down the area, hand in hand, yelling with excitement. We got to K9 Quelle and I took her off the bad guy. Abigail was celebrating, dancing and jumping for joy with her hands up when they announced that K9 Quelle had run 31 miles per hour to get to the bad guy. She was the second fastest dog, but I told Abigail the judges also score based on how hard the dog takes down the bad guy. I told her K9 Quelle may be small, but she was mighty! Abigail grabbed K9 Quelle’s leash and we ran out of the arena. We stood in the back when the results were finally in, they announced the third place dog.It was down to two dog teams, Abigail and K9 Quelle, and one more. They then announced the first runner up,and it was not Abigail. 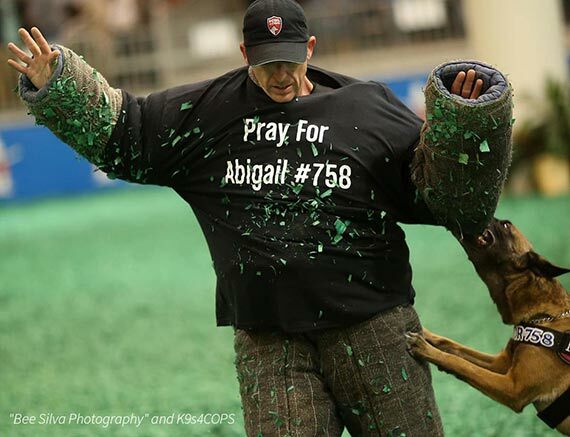 That means Abigail and K9 Quelle WON The event!! I told Abigail she won! She started screaming with joy and excitement yet once more. We entered the arena again, smiles bigger than the state of Texas on everyone’s faces, and tears in everyone’s eyes. A special trophy was given to Abigail. She held it up as high as she could, showing it off to the world. It was the most amazing moment of my life and career. Seeing that little girl, who is fighting for her life every day, win and have such a special moment with my special dog K9 Quelle, made my heart burst. Abigail kissed the trophy, and then held it towards K9 Quelle. She wanted her to take it home, as she said she is the one who took down the bad guy. I told Abigail that she won the trophy for her, and that it needed to go home with her. Before the event had started, Abigail had wanted ice cream, and I promised her that we would get some. Abigail said champions get ice cream, so she even got a vanilla ice cream for K9 Quelle! Seeing Abigail so happy made me so proud. I knew K9 Quelle was special, but she really proved that night that God placed her on this Earth for a reason, and that it was to touch lives. Because of K9 Quelle, I was connected with Abigail Arias, the strongest, most beautiful girl in the entire world. I keep praying to God for a miracle to heal her cancer and to let her continue living her life, as she has so much to live! I thank God every day for placing K9 Quelle in my life, as she has led me to some pretty amazing things, and people, such as little 6 year old Abigail Arias, who I love so much.